We are delighted to be sharing this interview with Natalie Alexandra Tse and Andy Chia from SAtheCollective. With the birth of their son Dodo, Nat and Andy began making performances together as Little Creatures by SA. Read on to find out more about Nadam (their latest performance for babies), what making art with each other and their son means to them, and why the “older generation” might wag their fingers at this pair of artist parents. This is part of a series of interviews with families that make art and perform/exhibit together. We hope there is something here for you. Rolypoly Family is beyond excited to share this abridged interview with Stephanie Nugent (mother) and Savannah Cox (daughter, in middle school), who live in Indianapolis, USA. They created and performed BOAT, a dance work that is now also a dance for camera. When we first watched a recording of BOAT, we were moved by the unfolding of a relationship between 2 artists – with their decisions, their mass, their touch, their trust, their selves, their femininity, and their history together. Thanks, Stephanie and Savannah, for chatting with us! A still from BOAT (a dance for camera). Photography by Charlie Borowicz (filmmaker). Hi Stephanie and Savannah! We love BOAT, as you know. We’re curious when the both of you started dancing together. Stephanie: Savannah, you want to start? Savannah: I was already dancing when I was in my mom's belly. She was dancing while pregnant with me and that’s when we first started dancing together. Stephanie: Yes, and when she was a little older, I would have friends come over to our house for dance sessions. Savannah was interested and would join us from time to time. We built a dance studio in our garage, so it ended up being easy for Savannah to join in. Would you tell us something about Boat? Savannah: I thought the name should be “bridge,” but my mom came in one day with the word “boat” and she thought it would be a better name. Stephanie: It was after we had finished the dance that I was looking back at a video and BOAT came to mind. For the majority of the dance, Savannah is on top of me and we improvised with the rule that she couldn’t touch the ground, kind of like the game “the floor is lava.” This made me think of myself as a kind literal and metaphoric boat for her. It seems to me that BOAT is more suggestive of me being “under” Savannah, supporting her body weight, than the word bridge. Whose idea was it to make it and perform it? Why? Savannah: It was my mom’s idea to make the dance, but once she brought up the idea, it was a team effort to create it. We wanted to do this, because it was special. I don’t think there has ever been another mother-daughter dance like this before and I wanted to show the world that there is a different kind of connection when you are dancing with family. So that is what we did. Stephanie: Savannah already mentioned the dance - "Yet-to-be-named" - that I made when I was pregnant with her. This was an incredibly special experience as well, because it was specific to a short window of time in our lives. Robin, my husband and Savannah’s dad, wrote the music for it and we performed when I was 7 ½ months (very) pregnant. After improvising with Savannah one day last spring, I realized that I wanted to capture (even if ephemerally), the experience we’ve been having, moving together while she is still a child. And, at 10 almost 11, the kid window is quickly fleeting. Where have you performed Boat and how have the experiences been? Stephanie: I was invited to conduct a residency at Lawrence College in Appleton Wisconsin, which included both teaching and performance. Knowing Margaret Paek, the woman who sponsored us, I thought this venue would be a wonderful place to debut BOAT. We presented six different works that each, in their own way, related to or expressed the female experience. The performance itself was in a fairly informal space with a hardwood floor and floor-to-ceiling windows that overlooked the beautiful campus. The audience sat in folding chairs, in a semicircle around us, and they were invited into some moments of audience participation throughout the performance, in which Savannah, the other dancers, and I took part. The intimate and immediate relationship we were able to cultivate with the audience created a perfect setting for BOAT and offered a potent inter-generational experience for the audience. Stephanie: I have been wanting to make dances for the camera for quite a while. Having seen many of my colleagues create beautiful works, I was excited by the numerous creative possibilities that were opened when the camera was the eye of the audience. I had also served on faculty at CalArts for six years, during which time I witnessed many of my dance students learning to work with this medium. After directing and performing BOAT with Savannah, I wanted to continue performing it, but I was aware that Savannah was growing quickly and the work would inherently change as she did. I put the word out on Facebook that I was looking for a collaborator to help me record BOAT before it was no longer BOAT, and to edit the work using the artistic magic of this new medium. Several Indianapolis artists all recommended the same filmmaker, Charles Borowicz. After speaking with him, I jumped at the chance to collaborate and began to plan our process. Charlie has a fantastic sensitivity to my aesthetic interests and is quite intuitive when it comes to the way he edits. He is currently working on a 2nd draft and we are really excited to debut it at the Indianapolis Fringe Festival in a couple of weeks! You mentioned seeing the still shot of Savannah and me in the creek. It was a beautiful (but cold!) setting and, yes, I got quite wet (laughs). But, I won’t say any more as I don’t want to give anything more away! Have there been times when you did not want to dance together or found it challenging to dance together? Stephanie: Savannah has been playing more soccer recently, so she mostly dances socially and when she puts music on at home. It is important to me that she does not feel pressured to follow in my footsteps so I’ve tried to minimize the amount of time we rehearse. When I first brought the idea to her, I told her that we would have to dedicate some time to the process if we were going to perform together. Luckily, she is a natural performer and improvisor, so we have been able to create a lot of the work by improvising with a score (guidelines to keep us on track), and then develop the structure by looking at videotapes of our improvisations. Funny enough, our biggest challenges have not come from lack of ideas, but from deciding what to include! Savannah: So, at times, I had a lot of ideas and so did my mom, and it was hard organizing it to fit in the piece, which was frustrating. We also have a lot of other things we need to do during the day, with me dealing with middle school and soccer, and mom having to work a lot. But, when it was finished, I was very happy with dance! Who else do each of you dance or work with? Stephanie: In the past I have worked with many other artists including dance improvisors Shel Wagner Rasch, Stefan Fabry and Kim Epifano, choreographers Victoria Marks, Keith Johnson, Selene Carter, Suzanne Lappas, Doug Varone, Doug Neilson, Laura Dean and Alison Chase (Pillabolus), writer Virginia Grise, and composers such as Eve Beglarian, and Belinda Reynolds. I also frequently collaborate with my husband, violinist/composer Robin Cox. Our most recent and long-term project is HOURGLASS, a live music and dance improvisation community event, offering participants the opportunity to move freely with community, in an immersive environment of live amplified violin and cello, electronic playback, and video projection. Savannah: I used to take ballet, but now I mostly create dances to my favorite songs, either by myself or with my friends, and improvise with my mom and her friends when they come over. Sometimes mom will find me in the living room dancing to my favorite songs, “My Shot,” from Hamilton, or “BO$$,” by Fifth Harmony, blaring from my ipad. Savannah is off to middle school! Congrats, Savannah. What will dancing and making together look like with this new phase? Savannah: Well, I’m starting practice again with my soccer team, I’m in my school choir, and I’m planning to sign up for Artistically Talented (the visual art club). So, I’m not sure how much I will be dancing, though I will definitely dance when I go roller skating, make a dance party in our studio, or score a goal in soccer! I might like to take a hip-hop class sometime too, but for now, I’m pretty busy! Any last words for dancing families in Singapore? Stephanie: Savannah kind of said it best, “there is a different kind of connection when you are dancing with family.” I’ll just add that dancing with Savannah has been and continues to be a unique and beautiful bonding experience for me, and I think for her as well . . .
Stephanie: So, I would just encourage your readers to seize opportunities to enjoy each other through dance. Whether you create performances together or simply enjoy moving for fun, these experiences and memories are what living is all about! Thank you, Stephanie and Savannah! 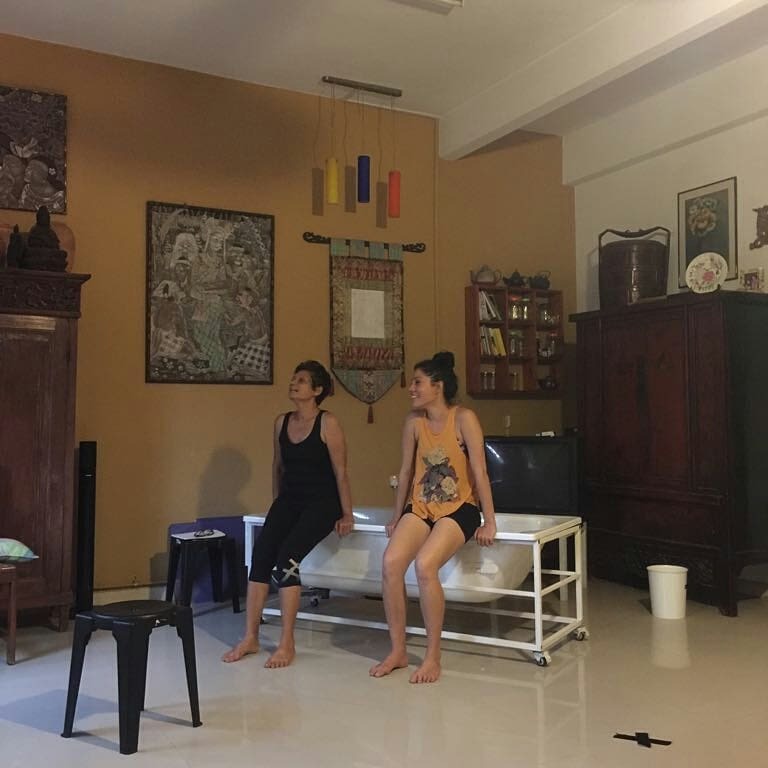 When we heard that Sharda Harrison of Pink Gajah Theatre would be making and performing a work with her mother, Ajuntha Anwari, we were thrilled, curious and perhaps a little envious. We know Sharda as a theatre practitioner, educator, and fellow movement improviser, so we approached her for an interview about Hayat, which premiered at the recent M1 Singapore Fringe Festival 2018. Thank you, Sharda and the Hayat team, for opening up to us. Over time, we hope to chat with more families who practice and make art together. Have you always made art as a family? No, actually. We kind of fell into it. Pink Gajah started off as a partnership between Najib Soiman (the actor/director) and myself. It took that partnership to fall apart for my team to start creating work first as a brother and sister duo - between Sean Harrison and myself - and then later with Lim Mei Yin, our sound artist. My mother Ajuntha and I started to work together only when Open Homes by Jeffrey Tan came as an opportunity. She was a performer and I was facilitating her in that performance in our own living room. How did your collaboration grow? The show for Open Homes was performed twice - once in 2015 and again in 2017. My mother and I created ‘I AM’ together based on a series of interviews with Ajuntha, mainly revolving around her neighbourhood, her childhood and her mother. The second version of 'I AM' became more intimate and layered. Hayat was a process that found its way easily. Ajuntha would be the lead and the story would evolve around her life - this time grounded in the Pink Gajah methodology of extracting a story and turning it into imagery, movement, media and sound. Can you share an anecdote that illustrates the difference between working to make art with family versus working with colleagues/peers? Working with peers is a safer zone. There is a certain professionalism displayed and asserted within the rehearsal room. It's a balance between knowing we can say certain hurtful things and go back to different homes to reflect on the conversation that had transpired between us. Sometimes, making art makes one push themselves to a certain limit in order to get the 'show' moving with the momentum it needs. Of course, performing with family and sharing the same rehearsal space in the same house is taxing! We can't go home! I go to my room and reflect a lot or take long walks away from Ajuntha. Yet at the end of the day it is completely worth it. It always is. Did you have concerns about working on Hayat as a mother-daughter team? What were they and did these concerns play out during the process? I didn't have concerns but over time, I realised it isn't easy. Tensions can arise just as easily as laughter can dissolve. However, the pay-off is an amazing experience... more than amazing. It’s difficult to describe the level of intimacy and friendship we developed, between mother and child. You choose not only to tell the unique story of your family experience, but also to use it to make live performance. Could you talk about why you decided to do this? What were some of the motivations? I was interested in the next walk of life - death. About ten years ago, my mother started to go on a voyage of her mind and spirit, and rooted herself more in the preparation and awakening of death. It only seemed apt to expand on this desire and to tell her story through imagery and text. I don't see my parents as just parents - they are also my friends, my brothers and sisters, teachers and students. My family unit is special in that way, and bizarre. Pink Gajah’s first work Bi(cara), later renamed Temuan (the meeting), was based on my father Bernard Harrison’s talk “Why do we do what we do?” Hayat's manuscript, so to speak, is my mother's life. One is a script about the human animal, the other is a script about the human spirit. In your performance description, you mention “the desire to walk with God, to survive in a highly urbanised world and yet hold onto our ancient groundings.” How does this play out in the work and in your family? Through instinct, images, song, movement, memories. My family: we're a weird bunch. My father is a scientific. My parents are divorced so my mother raised us not necessarily as a single mother, but in some senses, she did. We lived with her, as children usually do - they follow their mothers. She's lived in an urbanised world, chasing the dollar, running a spa, being a property agent and an insurance agent, being in the pyramid business... she's done it all. One day, she woke up and said, "no more." That day, she retreated back to her plants, jamu and the art of healing. 'Ancient groundings' to me is womb, mother, and the idea of what comes before and after. What are some of the things your friends and/or family said to you when they found out that you’re making this show as mother and daughter? The rest of the family smiled. I suppose nothing surprises them anymore. My friends were impressed and happy with Ajuntha. It is a big deal that we are putting her on stage as (more or less) a very new performer. It’s not been easy, but as I said, when all flows, it is rewarding. And it does flow. However, with such raw and sensitive material, not all family members want to come watch this show. My father, for one, would like to watch the show over video. He could not make it for the actual performance. A part of me is also sensitive because it is a difficult show to watch. Therefore, I understand when family members would choose not to watch it. This is, of course, something I took a mental note of from the beginning when i decided to make the work. In fact, i sought my father's blessings pertaining to some of the material that was discussed on stage. He was fine, as he is. My father is a wonderful, liberal and open man and I can only count myself lucky to be given such freedom to make this kind of work. Since creating this work together, has anything changed for you as individuals and for your relationship? A lot has changed. We have given each other the room to be more direct. We don't mask our emotions from each other. Our friendship and mutual understanding have grown too. Also, I am very aware and entwined in my mother's story. As much as this is healing for her, it is also healing for me and, hopefully, for my brother Sean (who is creating the media) too.